This site contains a video tutorial with notes on surface area and volume. 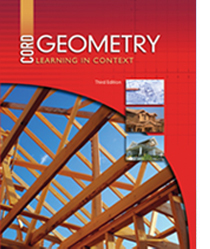 This page explains the geometry behind drawing three-dimensional objects. This page explains how to draw in perspective. This site explains perspective drawing through a series of stages. This page contains a gizmo to explore the surface area of prisms and cylinders. This site contains practice problems on finding the surface area of prisms and cylinders. This page gives the formulas for finding volume of prisms and cylinders along with examples. This site contains a gizmo that shows how height changes volume of prisms and cylinders. This page explains pyramids and cones and gives formulas to find surface area and volume. This page has examples on finding the surface area of pyramids and cones. This page has examples on finding the volume of pyramids and cones. This page discusses the sphere and the different parts of it. This site has links to different pages explaining the geometry of the sphere. NEW This page discusses some traits of similar figures, including the volumes of similar solids. This page defines cross sections and has practice problems with solutions.